Activated 1 September 1980 and assigned to the 2nd Armored Division at Fort Hood, Texas. In the mid 1980’s, the Battalion was assigned to 2nd Armored Division (Forward) in Garlstadt, West Germany as a part of NATO Northern Army Group. Inactivated 15 April 1992 at Garlstadt, West Germany . 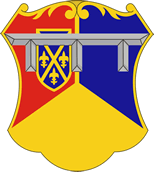 Activated 16 December 1992 at Fort Hood Texas and on 16 January 1996, 3rdBattalion 66th Armor was relieved from assignment to 2nd Armored Division and assigned to the 4th Infantry Division. Inactivated 16 December 2004 at Fort Hood, Texas. Activated 17 March 2008 in Schweinfurt, Germany and assigned to 172nd Separate Infantry Brigade.